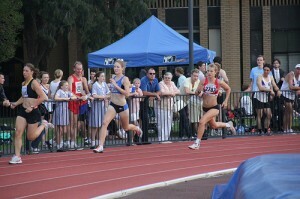 Eliza Curnow (4:48.8) and Tyson Popplestone (4:11.1) won Victorian Championships over 1 Mile at Melbourne University’s Rawlinson Track on Thursday, 17th of February as part of Victorian Milers Club’s Meet 4. Whilst Merv Lincoln’s 1957 track record of 3:58.9 (the third sub four minute mile by an Australian and the second run in Australia) wasn’t threatened, the racing was fast and hard fought on the tight bends of Melbourne University’s atmospheric track, with the dreaming spires of Ormond, Queens and Trinity Colleges as the backdrop. Merv’s son Tim Lincoln and wife Dawn Lincoln were on hand to present the medals to the Champions. Curnow countered a mid race surge from Melbourne University Athletics Club’s Sophie Barker and kicked home to take her first open Victorian Championship ahead of Melissa Duncan and Sarah Klein. Popplestone ran a strong second half and came to the front with less than 200m to go to win convincingly from Mark Blicavs and Tim Norton. 190 athletes took to the Rawlinson Track, with 17 800m races and 6 mile races staged over two hours of high quality middle distance racing. Spectators and competitors packed the rails of the track to cheer on the runners. 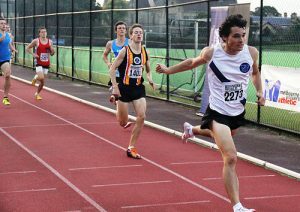 A warm, still night, enthusiastic crowd, the dulcet tones of commentator Paul Jenes and music playing in the background combined to provide the atmosphere for an enjoyable evening of athletics.18 Melbourne University Athletics Club members delighted in racing on their home track, with Jordan Mayston running 1:56.8 to claim an 800m personal best.